Dark Places commenced with a gripping story line, the Gillian Flynn style, written in first person context. The lead character, Libby Day is as negative as she could get about life, living with a tarnished memory of family massacre that she witnessed during her childhood , at the tender age of 7. She and her brother being the only survivors are the last two members of the Day family with the exception of their father who hasn't stayed in touch with them ever since those last few days. The only difference is that Libby, now an adult is making both ends meet to survive and her brother has been living in jail since the age of 15, allegedly convicted of murdering his family and for being a Satan worshipper. Libby, on the other hand, is living off the tail end of depleting finances she gathered as a result of a book published regarding the Kansas City Massacre - her family's massacre. Getting a call from her lawyer to inform her about this grave situation she is left struggling to look for answers. This is when she decides to get in touch with Ben after all these years to further investigate what actually went wrong that night. Lyle Wirth is a member of the Kill Club, a club obsessed with solving crime, he probes Libby about Ben and leaves her wondering if her only sibling alive is innocent and has been rotting in jail for a crime he might not have committed. Her self pity, hatred and suicidal thoughts have done no good after all these years, the lack of real friends have affected her deeply, not leaving good thoughts about relationships, neither has her kleptomaniac habit of collecting souvenirs from whatever place she goes to or whoever she visits has ever helped. But who knew she would eventually escape a murder attempt herself and a stolen lipstick in her pocket would trace back to the evidence of a very important lead. 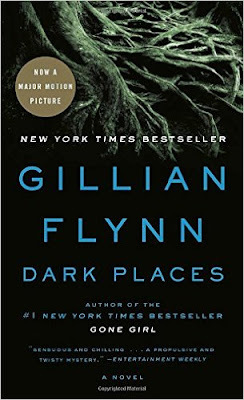 Dark Places, though a good read cannot beat Gone Girl a great novel which even the movie did justice to, shooting every scene as depicted in the book and with Ben Affleck and Rosamund Pike being the perfect cast choice. Now a motion picture, featuring Charlize Theron (well she is pretty tall and Libby is supposed to be 4 feet something - a good choice of actress still), Dark Places is set to awe the audience. Both siblings' father appears out of the blue or rather Libby tracks the drunkard down only to meet him face to face berating her mother, a poor woman who only wanted the best for her children. What will Libby do to save her brother now, who is despised even by his own father? It's all in the book that you must read. I liked Dark Places, the story plot, its twists and turns, and overall suspense left my head itching with dandruff, leaving me with the choice of Head & Shoulders, well I have been using it as the preferred shampoo for combating dandruff and it's needed when you've been studying or reading a lot I guess :) . The brand has recently announced Sheheryar Munawar as its new brand ambassador in Pakistan and he strikes as the perfect choice for the character of Lyle Wirth, better than the one shown in the movie trailer. Munawar is very excited for becoming part of the Head & Shoulders team and probably would have been equally elated if taken aboard this movie. Totally agreed with you that it was very predictable but I like the story and plot twist.